Home > About The Ozone > What Can be Done to Halt the Damage to the Ozone Layer? The signing of the Montreal Protocol and subsequent international agreements on ozone depleting substances have already done a great deal to prevent further damage to the earth’s ozone layer. Most scientists now agree that within somewhere between 30 and 50 years, the hole in the ozone layer over Antarctica should disappear. It will take that long because many of the chemicals now banned take a long time to reach the stratosphere and cause ozone damage. The main concern of environmentalists now is that action being proposed to combat global warming could cause further damage to the ozone hole. For example, there have been suggestions that we should inject massive amounts of sulphur into the atmosphere to reduce temperatures, mimicking a volcanic eruption. It is well documented that volcanic activity achieves lengthy periods of cooling. In 1815, for example, the eruption of the Tambora volcano in Indonesia had such a cooling effect that the following year was known as the year without a summer in New England because snow fell in every month of the year. However, the ozone depleting substances from a volcanic eruption do not reach the stratosphere, unlike manmade CFCs. Many experts say that releasing further ozone depleting substances into the atmosphere to combat climate change is simply resolving one problem to create another. Many researchers are also concerned about the effects of a nuclear incident – computer modelling undertaken in America suggests that two countries releasing 50 devices each could devastate the ozone layer, with reductions of up to 70% in parts of the globe. There are also fears about illegal trade of ozone depleting substances, particularly in Third World countries where the technology isn’t available to manufacture less damaging substitutes. The Environmental Investigation Agency claims to have proof that illegal trading of CFCs is now widespread and involves organised criminal networks. In Britain, we have specially trained Customs Officers who look out for attempts to import or export banned chemicals. In the UK, there is potential for CFCs to be released if households dispose of their old fridge-freezer by simply dumping it. Until around 1995, CFCs were used in the cooling system and they continued to be used in some appliances in the insulating foam until 2005. 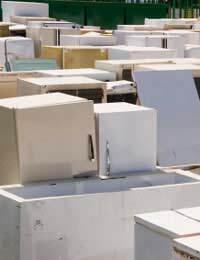 One problem is that many people lack the transport to take their own appliance to a certified disposal point and some local authorities charge for collecting them. This can encourage people to fly tip rather than arrange for a collection - the opposite of the situation in many parts of America where energy companies once offered a “bounty” for old appliances. Another problem can arise with older cars because CFCs were used in car air conditioning systems prior to 1993. Halon gas was previously used in some fire extinguishers and although they are no longer available, many people may still be in possession of them. It is now illegal to service this type of extinguisher because during testing it has to be discharged.